Well, that the opinion of ALAN FEUER in his Rooms column in today’s (April 22, 2009) of the New York Times (Time and Tide Gnaw at a Downtown Enclave) While sounding a little harsh, there is more than a ring of truth to it and frankly therein lies the India House’s charm. At least for me. A maritime curiosity shop as much as a luncheon club, the India House was where I was taken on a number of occasions by the “big wigs” to celebrate successes when I was cutting my business teeth. For good luck it was always a good idea to rub the belly of the big fat smiling Buddha standing sitting guard inside the front doors. If you like maritime culture, history and heritage, this place is like Disneyland (with cobwebs and expensive threadbare Persian rugs). Click on the above article for a PDF download of the original 1914 story which makes interesting reading. I was particularly struck by the following paragraph which shows how little things have changed in nearly 100 years. This economy is causing all kinds of casualties. And while most people wouldn’t notice if the India House rolled up its carpet, it would be a real loss to our national maritime heritage. And heck, where else can you go and grab a good turkey club and feel like you are eating in a maritime museum. The NY Times has a cool interactive feature you should check out. It’s a cold, damp, dark Wednesday here in Mattapoisett. 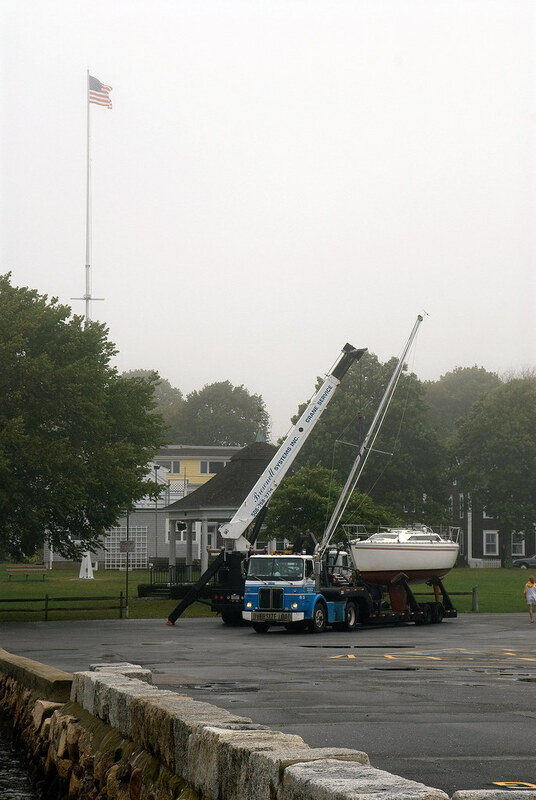 It’s that sad time of year where boats are hauled every day and the harbor get’s handed back to the winter sticks. Now that’s a soup after my own heart! Big, big news on the next Pirates of the Caribbean movie, courtesy of one of our most reliable tipsters. Our proven informant (who we’re forced to keep anonymous) wants you to know the following info should be taken with a “grain of salt and a dose of pepper,” things are still in motion, but here goes anyway. Wondering how they’re going to make a whole Pirates movie with just Jack Sparrow? Or who else might return? Read on! Most excitingly, there are talks of Captain Jack having a brother in the next movie, possibly to be played by Sacha Baron Cohen (perfect!) or Russell Brand (even more perfect!) Of course, that’s probably just fantasy casting, but why would either of those comedians turn the role down? As we’ve mentioned before, the new movie might kick off a trilogy, which would revolve around Captain Jack’s search for the Fountain of Youth. Geoffrey Rush and director Gore Verbinski are apparently both planning to return, but… and this is a big maybe… Tim Burton might direct instead. Tim Burton! Okay, it’s just a rumor but heck, it’s something fun to think about while the financial markets collapse, the war rages on, real pirates attack ships off Africa and politicians argue about the same thing and nothing. Anyone who’s ever sailed out of Newport, RI or driven over the Newport Bridge will recognize the the house on the rock in the above photo. On August 6, 2008, the NY Times’ Who Lives There column by Penelope Green was titled The Old House and the Sea and profiled the appropriately named Clingstone and it’s current owner, architect Henry Wood. Built in 1905 at the cost of $36,982.99, Clingstone was basically abandoned in 1941, and then purchased by Mr. Wood in 1961 for $3,500 in derelict condition. With 23 rooms and 10 bedrooms, life on the rock is not exactly luxury. Today, solar panels heat the water, and a wind turbine on the roof generates electricity. Rainwater is collected in a 3,000-gallon cistern, then filtered, treated and pumped through the house for cleaning purposes. (Mr. Wood claims it is safe enough to drink, “but my children don’t trust me so we don’t,” he said.) After years of using an activated seawater system that draws in seawater, then treats and filters the waste before releasing it back into the ocean, Clingstone now has the latest generation of composting toilets. There are some cool contemporary maritime influenced art projects currently on exhibit across the globe, so we’ve declared this Maritime Art Week on the Sea-Fever blog. Here’s the final and maybe most challenging and interesting installment of this series. In 2007, Weiner created an exhibit for the New Visions contemporary art program at the National Maritime Museum in Greenwich, England, titled Inherent in the Rhumb Line. The National Maritime Museum explores how human beings have sought meaning in the sea, time and the stars. At Greenwich the imponderables of time and space collide: this is the home of Longitude 0°, where one can stand on an arbitrary line marking out the starting point of each new day, year and millennium. Every place on the globe is measured east or west from this Prime Meridian, creating a framework for individuals to understand their place in the world. 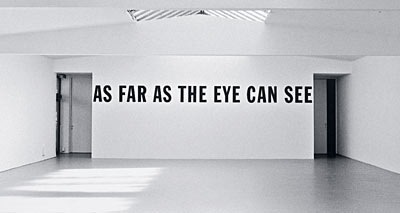 Lawrence Weiner’s artistic practice questions the subjectivities that create such constructs of understanding. Using observation and experiment, the artist interrogates the relationship of material objects to each other, and the relationship of material objects to individuals. Like Simon Patterson, another Maritime Art Week artist as well as an New Vision’s artist, Weiner medium is often language and ideas. Much of Lawrence Weiner’s artistic practice takes the form of language and his statements have been inscribed as text inside and outside the gallery, as well as taking the form of spoken words and printed matter. At the centre of this exhibition the words to a somewhat romantic song, Sailing Sailing, point elsewhere: songs, after all, are designed to be sung and heard, rather than read. 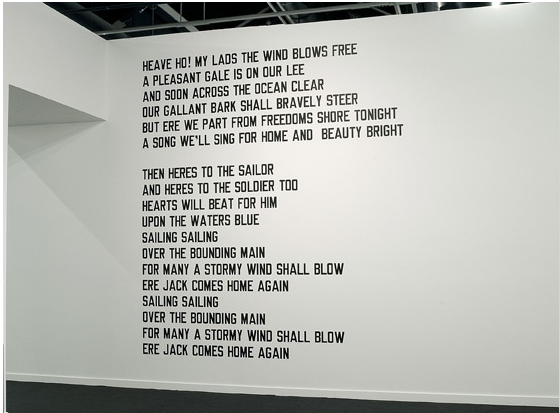 Shown beside Weiner’s 2005 film Inherent in the Rhumb Line from which this exhibition takes its name, this song alludes to the freedom of the seas and navigating over the bounding main. As with traditional songs of the sea, Sailing Sailing has been handed down, passed around, reinterpreted and repeated, with each version as true as the next. 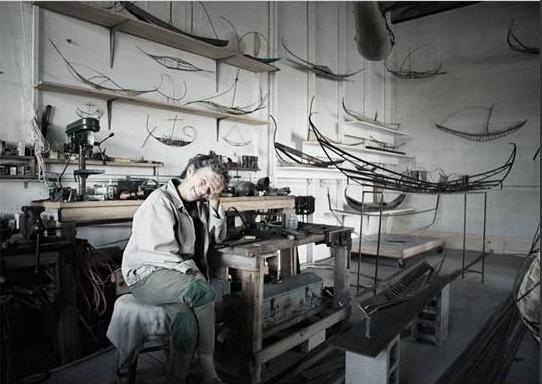 Arden Scott‘s love of the sea and a good yarn has informed her sculpture for many years. The lyrical curves prevalent in her boat effigies allow them to float through space and offer the imagination infinite nautical stories. Although primarily built in heavy materials, her boats retain a delicacy that seems as much like a three-dimensional drawing as a sculpture. 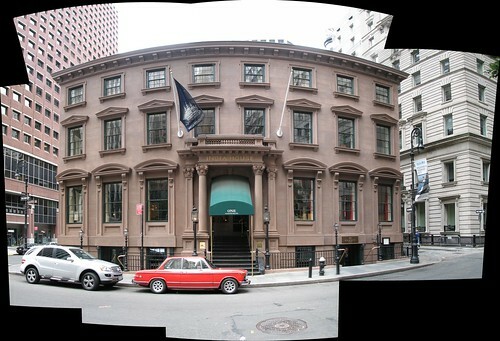 Scott began her career as an artist in the sixties, pioneering in the urban wilderness that is now known as Tribeca. 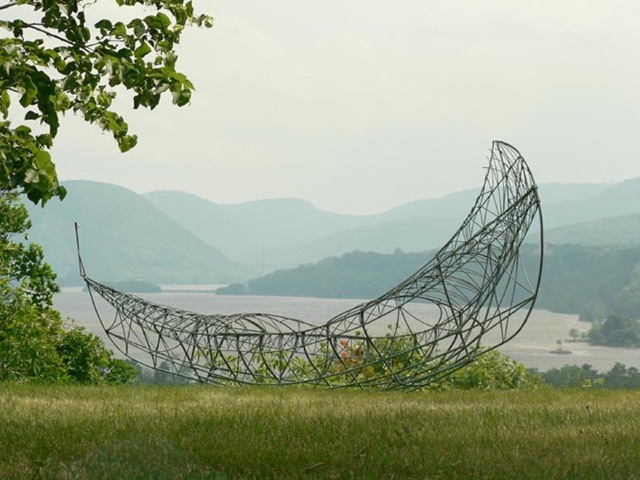 She made sculpture out of found materials from constructions sites: the World Trade Center, as it was being built, was an especially fruitful landscape and much debris has been elevated into a position of artistic value in the hands of Scott. Her artwork has been shown in galleries, museums, public spaces and outdoor sites all over the world. Scott has received numerous grants including a Guggenheim Fellowship, and her work has been featured in renowned publications throughout her long career. When she is not in her Long Island studio working on her boats, Scott is sailing the 28′ wooden schooner she built for herself, the Annie. I love everything about this artist work! Since there are some cool contemporary maritime influenced art projects currently on exhibit across the globe, we’ve declared this Maritime Art Week. Here’s a peak at a another. “That boat is a work of art.” No I’m not talking about one of the classic yachts designed by Olin Stephens, who by the way turned 100 years old on April 13. It’s the Tate to Tate Boat whose exterior and interior were designed by British artist Damien Hirst. While yesterday’s artist, Simon Patterson, was a Turner Prize shortlister, Hirst actually took the award home in 1995. Even if you don’t know anything about contemporary art you might have heard of Hirst’s diamond encrusted skull which last year reportedly sold for $100 million. 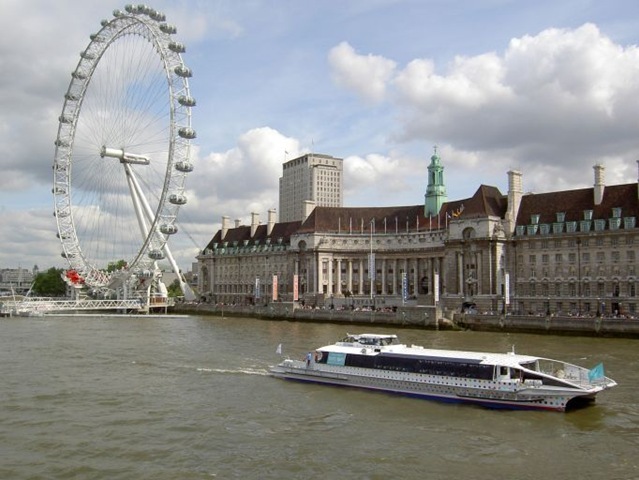 It is the fastest tour boat operating on the Thames, cruising at 27 knots. Video guides to Tate Modern and Tate Britain by the artists Anish Kapoor and Sam Taylor-Wood are shown on board. The Tate Britain and Tate Modern are without a doubt my 2 favorite art museums on the planet. The Britain has the most amazing collection of J.M.W. Turners and the Modern’s Turbine Hall is an amazing space for large scale contemporary projects. You can ride in style between these 2 wonderful art destinations.